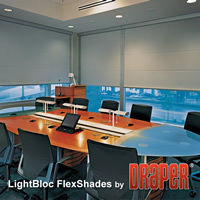 Our blackout shades block out all light coming in from any window so you can see wall projections and presentations as clearly as possible. Bottom Velcro ensures that when you pull the shade down, it stays down. Pick up a set today and start seeing your presentations in a whole new light.